Rodent models of a variety of conditions are widely used in biological research and are invaluable proxies for studying fatal or otherwise devastating diseases of humans that one would not study in an interventional manner (e.g. testing various early phase drugs or other treatments on a human being with that condition). Mouse models of various diseases have spared countless human lives by allowing scientists to understand and to develop treatments for these conditions as well as to enhance our basic understanding of the mechanisms underpinning them – perhaps ultimately leading to effective treatment modalities. We have spent much of our time at the Center working on cancer prevention, and more recently on autism spectrum disorder (ASD). Two very intriguing papers utilizing mouse models have recently come out of the University of Alabama and the University of Virginia that address breast cancer and autism prevention, respectively. 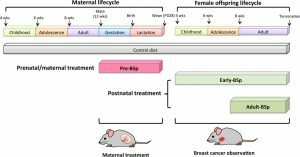 In the first paper (Li et al 2018), prenatal maternal dietary exposure to sulforaphane from broccoli sprouts was most effective in inhibiting mammary tumor development (the mouse model of breast cancer) compared to postnatal early life (pre-puberty) and adult broccoli sprout treatment in two separate mouse models. 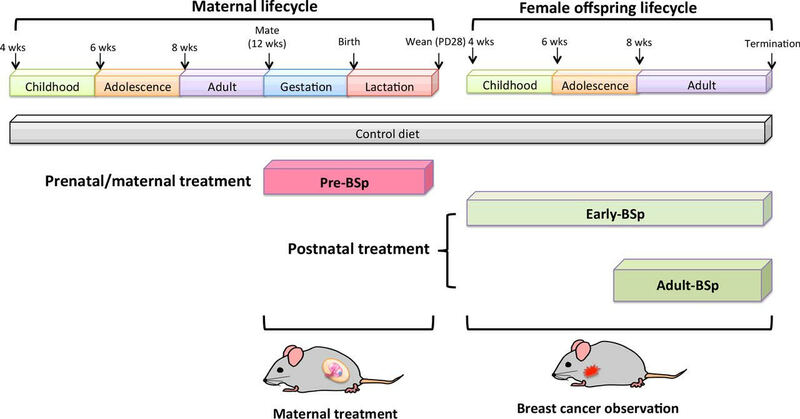 The authors present evidence that this may be related to epigenetic reprogramming effects (controlling the expression of genes, which can impact things like disease susceptibility in later life). This is one of many studies implicating in-utero exposure to dietary ingredients as being of great potential importance to later physical and mental development as well as disease susceptibility. From Li et al. 2018. Cancer Prev Res; 11(8); 451–64. copyright 2018 AACR. The second paper (Lammert et al 2018), explores the absolutely critical role that the gut (e.g. intestinal) microbiota (the bacteria, viruses, and other creatures which inhabit your insides) play in our development. In this particular mouse model, autism, or autism spectrum disorder, is targeted. The authors find that preconception manipulation of the microbiota can transfer susceptibility to autism (in a mouse model) from one animal to another. They further show that this susceptibility is related to maternal immune response mediated by a well known mediator of proinflammatory responses. Therapeutic strategies stemming from this study too, could involve dietary changes to modify maternal microbiota. We are happy to provide pdf files of these papers to anyone who cannot access them and would like to examine them more closely. Just leave your email on the contact page and indicate which paper you’d like.